I’ve always written off slip covers, assuming they look sloppy and are a short cut way to update furniture, but my mind has been changed completely in the past few years. Slipcovers have come a long way and look fantastic nowadays. 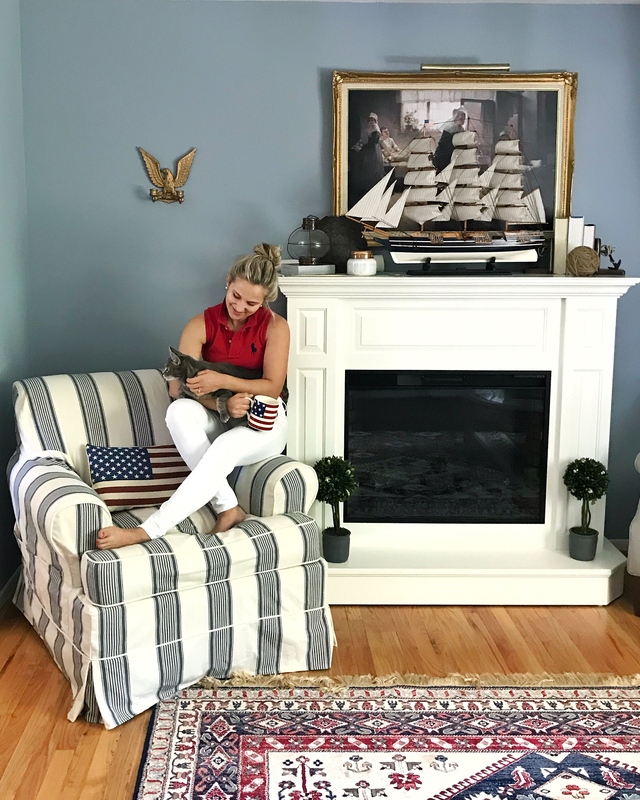 The slipcover look is even in style – just look at fabric dining chairs from Pottery Barn and you’ll see what I mean. I love furniture and design, and the weakest part of my decor has always been this chair I have in my back room. It’s very high quality, a nice size, and comfortable, so I didn’t want to replace it with another chair but I didn’t love the style. 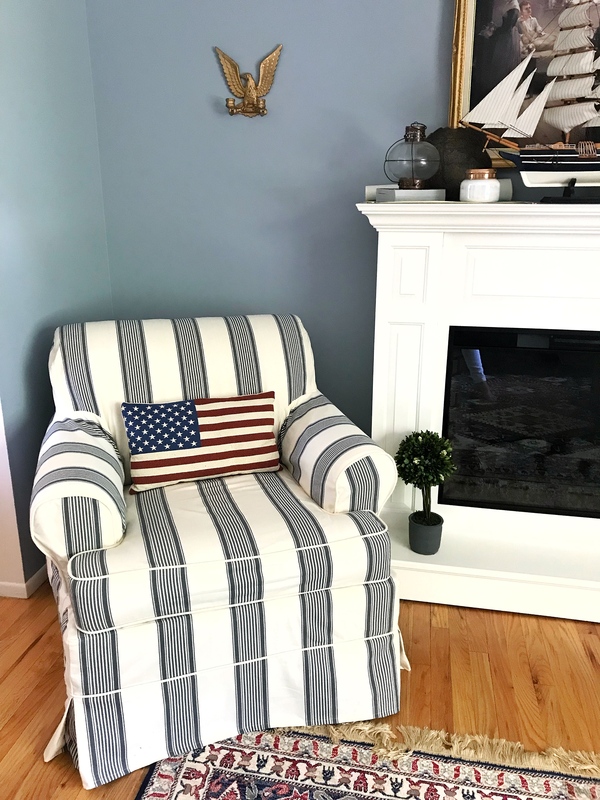 Behold, Comfort Works worked closely with me to design a slipcover that converted my chair to fit in with the decor in the rest of my home. ht Special thanks to my cat, D.W. for modeling the before and after shot. 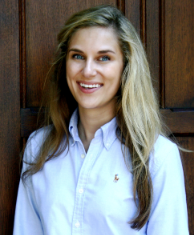 The process was daunting to me. 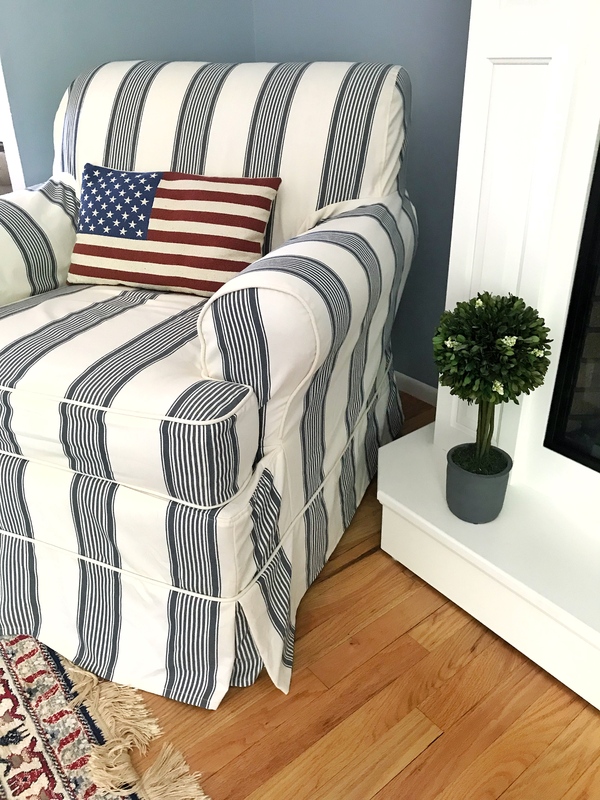 Comfort Works does a lot of slipcovers for chairs/couches they already have a pattern for – like IKEA or Pottery Barn – and this would be a custom project. It started out with them sending me 5 sample fabrics of my choice. I (of course) chose the stripes as it coordinates great with the other furniture in the room. The entire communication and help surpassed all my expectations as they worked closely with me to ensure I got the right fit. 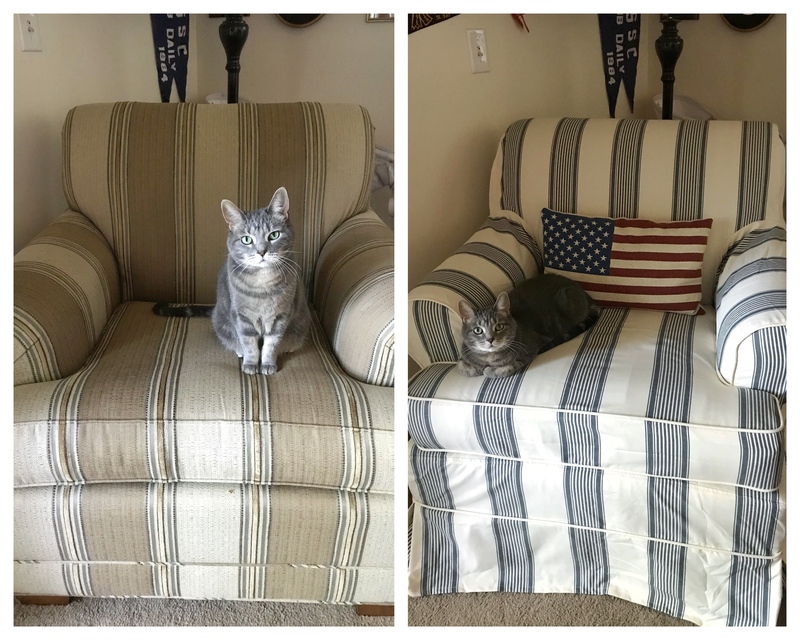 I sent in photos of my chair and they sent back photos like the one below, indicating what measurements I needed. I messed up a few and they caught it and emailed me about it right away. It made me feel great knowing they were double checking everything. I can’t emphasize enough how painless the entire process was. I am extremely impressed by Comfort Works and Rachel and Sarah who I worked with. The cover fit perfectly and looks great. 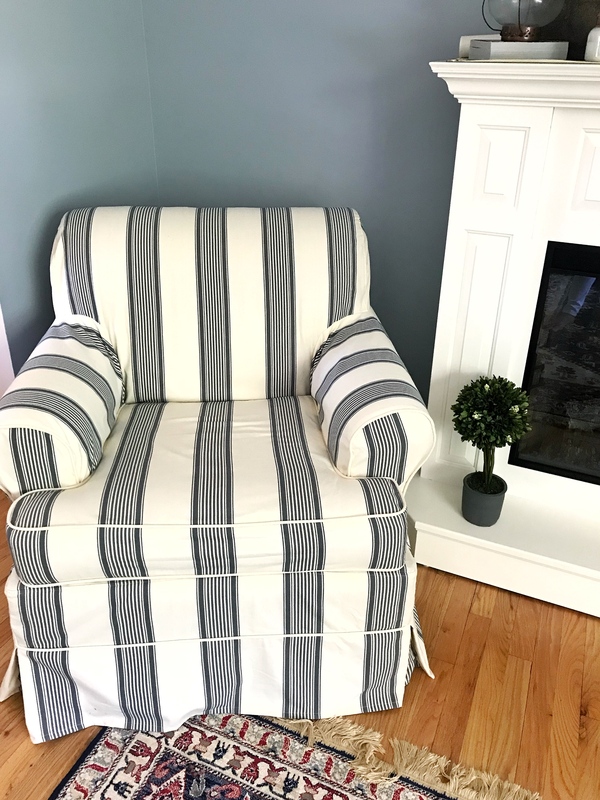 Taking my beige striped chair and using the new slipcover has brightened up my space. My favorite part of the chair is the pockets they added to the side. We always have random remotes laying around, and now we both know right where they’re at. There’s also a bigger pocket for catalogs/magazines as well. There are even more options for pocket configurations, piping color, and bottom pleats. I like the corner pleats they put on mine. Overall, I’m extremely satisfied with the ease of ordering a slipcover and that is thanks to the customer service Comfort Works provided. 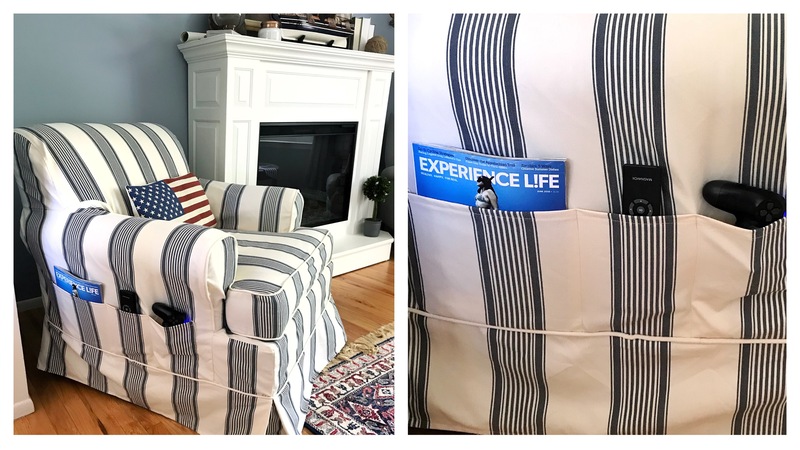 I’m now a believer in slipcovers – not only do they give my chair a whole new look but it’s nice knowing I can throw the cover in the washer if something were to happen. Have you ever used a slip cover? What was your experience? I’ve never had to slipcover anything in our house before, but this company looks like the one I would like to use if I ever needed to. I love the look of your chair now and those added pockets on the side are so nice and functional! Yes they are so helpful! I was looking into replacing this chair but it was a high quality chair and just needed a facelift. So glad I got the slipcover!